English rules not included unless noted in the condition note. 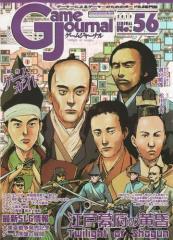 This is a game on political conflict in the last years of the Japanese Edo period (1856 to 1867). The basic game engine is based on Twilight Struggle. Players control either the pro-Tokugawa Shogunate or anti-Shogunate (Imperial) faction. Each turn players play historical event or common political operation cards. This mostly helps them to place their own influence points or remove the opponent's influence points. The difference of influence points determines the control of hans (domains), and it also affects control of areas. The winner is determined by victory points, mostly gained by area control.